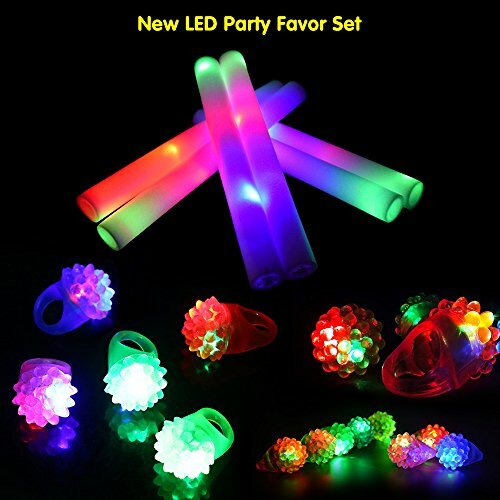 LifBetter 12 PCS LED Bumpy Rings, with 12 PCS LED Foam Glow Sticks, Flashing Glow in The Dark Party Supplies Perfect for Wedding Birthday Festive Party Decoration 24 Pack by LifBetter at Saltarines Quito. MPN: LBT035-O-FBA. Hurry! Limited time offer. Offer valid only while supplies last. New Set Family Party Choice: This bulk foam glow batons pack features 12pcs 16" LED foam sticks & 12 pcs LED finger lights in assorted colors. One price, more economic. Comfortable Design：The light up rings for kids are made of good rubber material. The light up finger light can fit for different size fingers. These light-up rubber rings are stretchy, feel like jelly, very comfortable touch. You will not feel tight even wear on your thumbs! Just press on the button, the led ring for kids will be flashing, which can last more than 12-15 hours. Colorful Foam Lights sticks with 3 Flashing Modes: Press the power button to switch between the 3 different light up modes, Quick flashing, Slow flashing, and Alternately flashing. Foam batons with high light output 300 mah of 3 batteries included in each piece,which can last more than 6 hours. Perfect for Birthday Parties, Party Favors, Camping Trips, Halloween, Glow Party, Concerts, Weddings, School Classroom Rewards, Treasure Box, Carnival Prizes, Pinata Toys, Bath Tub Fun, Bars and All Other Use. Worry-free Guarantee-- We promise to our every client if you have any quality problem when using, please BE FREE to contact with our customer service for returning, refunding and replacement. That is why we are confident to do this well than other sellers.